Being a second-generation potter, my rural home was alive with handmade objects. This influenced both my growth as a person and as an artist. I envision my pottery in people’s homes, filling their cabinets, displayed out on dining room tables, and laying used and enjoyed at the bottom of a sink. The home represents a place for family and friends to gather and enjoy each other’s company. I want my pots to be a part of the conversations and stories that are shared during times of celebration as well as day to day happenings. Landscape also plays a large role in my pottery. During my childhood and into my adult life, my free time was spent lazily strolling down a country road and camping in the forests of local state parks. The hills, mountains and rivers that I interact with when I am hiking or camping are the reference points for the forms of my pottery. I currently live on the gulf coast of Florida. This too has had a massive affect on my work. Soft waves, beach textures and dunes have all played a roll in striving for a quiet sense of color and texture on my pots. It is the atmospheric kilns that I find most appropriate for creating the surfaces of my pots. It is important that the pots catch the flame and force it to flow through the crevices and around the body of the pot. I want my pots to catch the flame and be scarred by its’ movement. I imagine the flame moving through the kiln in much of the same manner a river would flow through a valley. I try to recreate the same feelings and emotions that I receive in nature and relive them in my work. 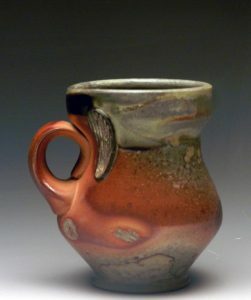 My pottery allows me to experience personal memories and express emotions while still allowing the viewer to be able to relate to the forms and functions of the pieces.